Note: See another post that features the 1884-1896 autograph album of Mary Burt, daughter of Nancy Lenora (Farr) Burt and John Burt. 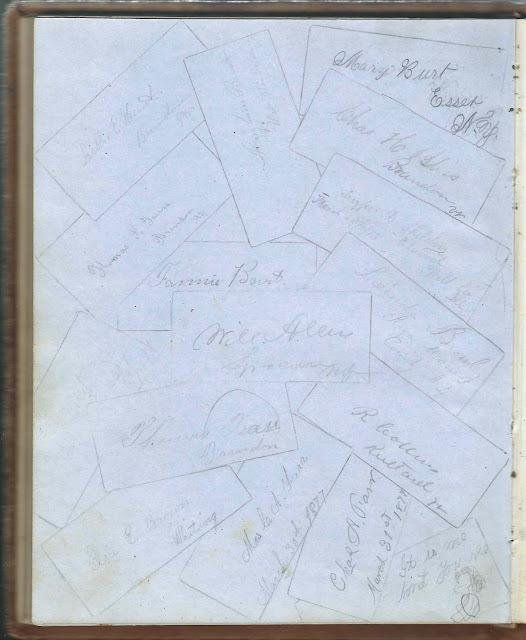 1854-1886 autograph album of Nancy Lenora (Farr) Burt of Brandon, Vermont, and Essex, New York, from before and after her marriage to John Burt. 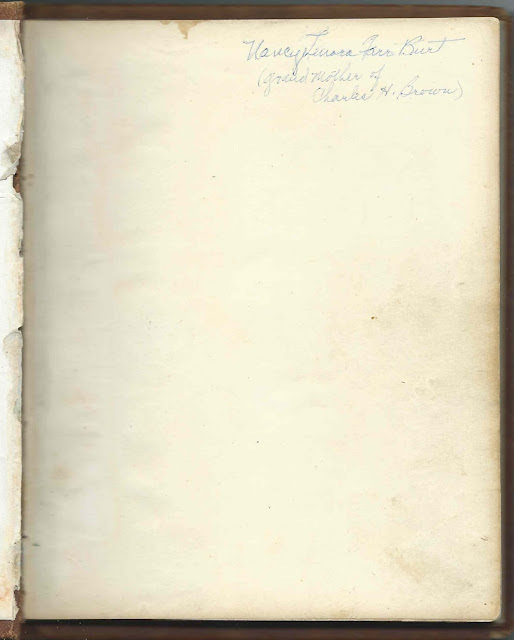 Someone wrote Nancy Lenora (Farr) Burt's name on the first end paper and noted that she was the grandmother of Charles H. Brown, who was the son of Mary Burt, mentioned above, and her husband Clyde R. Brown. 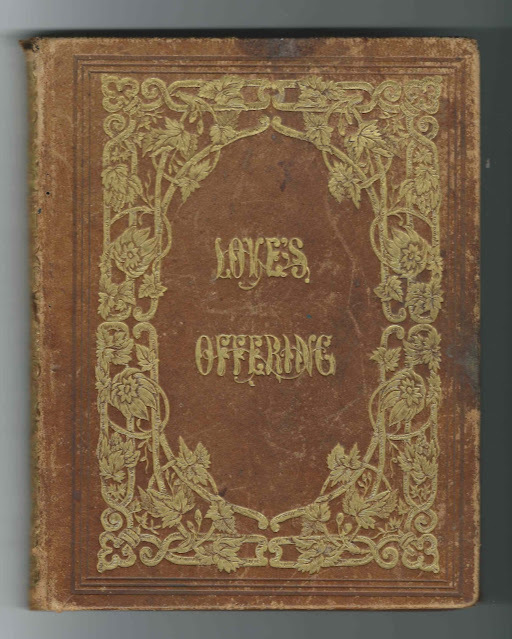 The album measures approximately 8" x 6-1/2" and contains the sentiments of 113 of Nancy Lenora (Farr) Burt's relatives, in-laws and friends. An alphabetical surname list and an alphabetical list of the signers appear at the end of this post. 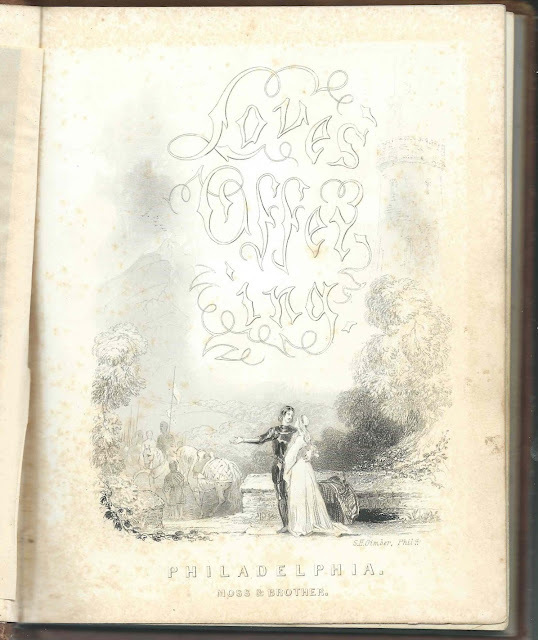 The album was printed by Moss and Brother of Philadelphia and includes engravings scattered throughout, including the frontispiece and title page. Nancy Lenora (Farr) Burt, "Nora" or "Nancy", was born 22 December 1835 at Brandon, Vermont, the daughter of Thomas Gibbs Farr and Martha (Fales) Farr. Neither of her parents inscribed pages in her album, but I believe it was her mother, Martha (Fales) Farr, who inscribed a page as "Grand Mother" in Mary Burt's album, mentioned above. Many of Nancy Lenora's other relatives signed pages in the album. 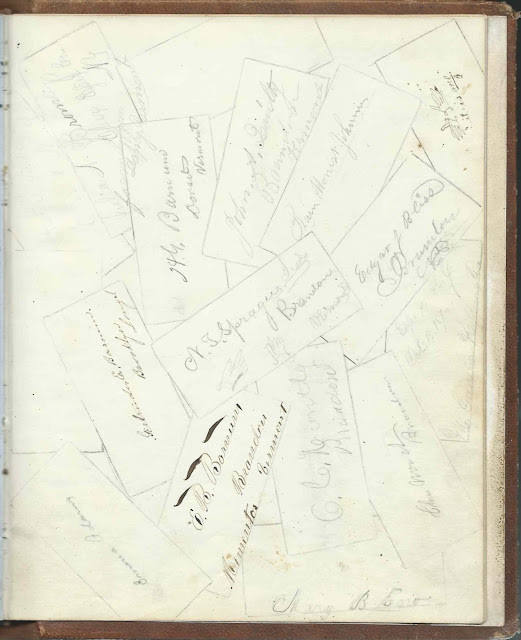 Some of her relatives moved to the Midwest, including her uncle Volney A. Farr, whose family apparently invited her to their home at Springfield, Ohio, in 1856, where she acquired many autographs from people in that area. Sometime in the late 1850s, Nancy Lenora Farr married John Burt, Jr., son of John Burt, Sr., and Susannah (Sherman) Burt of Essex, New York. 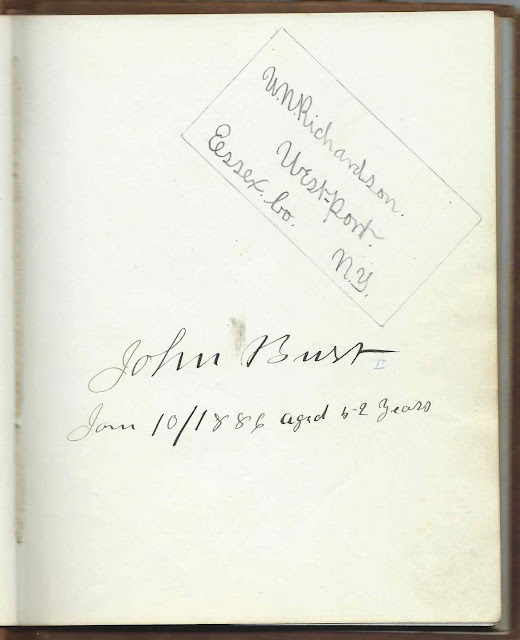 John Burt signed a page in the album on January 10, 1886 and noted that he was "aged 52". He shared the page with W. Richardson, or W. W. Richardson. Fanny Burt contributed to a group page of signers mostly from Vermont in the 1880s. Mary Burt contributed at least once, if not several times. 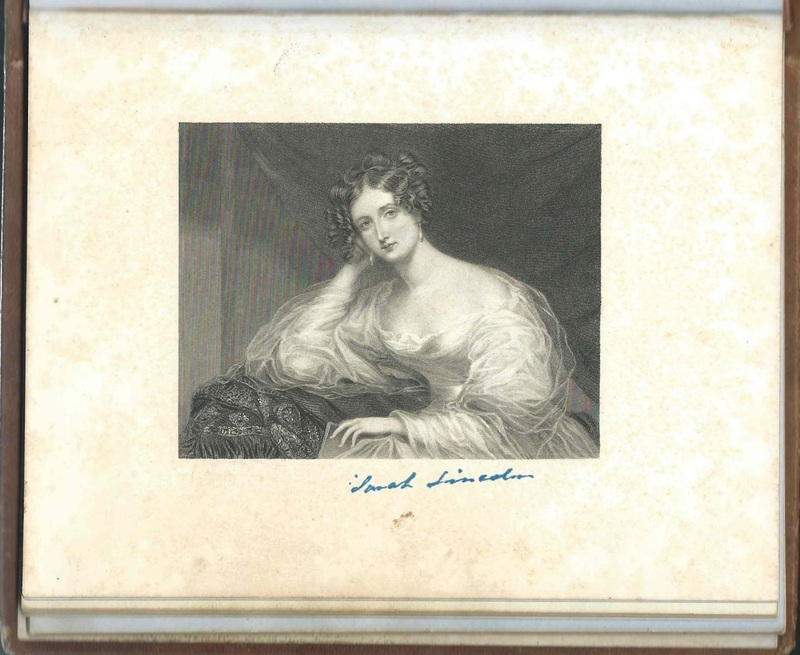 One of the engravings in the album has the name "Sarah Lincoln" in blue ink written beneath it. I believe this was written by Nancy Lenora or someone else, not something printed when the album was created. Perhaps friend Sarah Lincoln resembled the woman in the engraving? B. Barnard, Jr. Presumably Barzilla Barnard, Jr., brother of Emeline A. (Barnard) Farr, wife of Volney A. Farr. Mary J. Burt. Nancy Lenora (Farr) Burt's husband John Burt Jr., had a sister named Mary, but I don't know what her middle initial was. This Mary could have married a Burt.
? Derby, signed at East Poultney, Vermont, on January 29, 1855. Possibly J. C. Derby. V. A. Farr; presumably Volney A. Farr, a brother of Nancy Lenora (Farr) Burt's father Thomas Gibbs Farr. His wife Emeline A. (Barnard) Farr signed the right facing page. Emeline A. Farr, signed at Springfield, Ohio, on August 7, 1856. She was Emeline A. 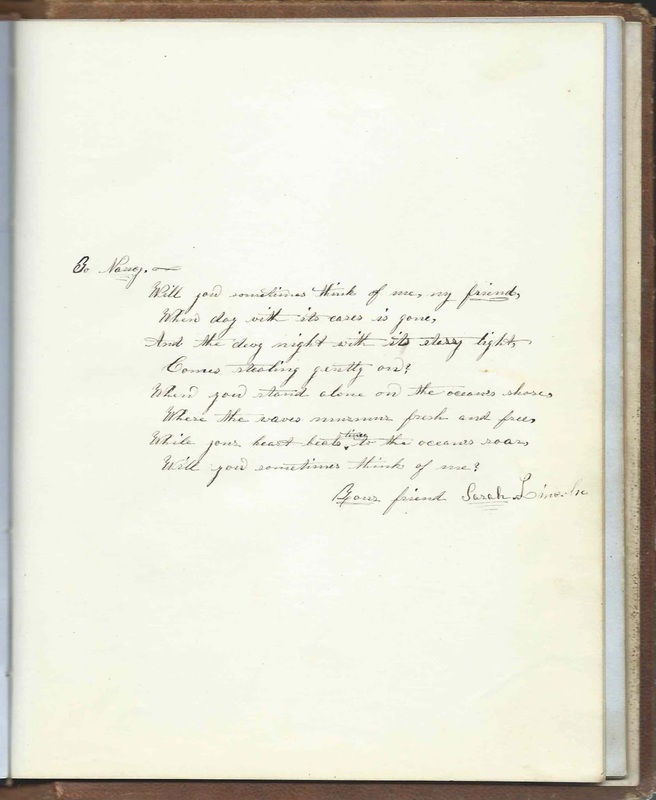 (Barnard) Farr, whose husband Volney A. Farr signed the left facing page. Mabel D. Farr, signed on August 5, 1877. She was Mabel Dean Farr, daughter of signers Volney A. Farr and Emeline A. (Barnard) Farr. Mrs. C. A. Farr, signed on March 30, 1877; perhaps Minnie A. (Chatterton) Farr, wife of Nancy. Shared the page with 15 other people, mostly from Vermont Lenora's brother Charles A. Farr, who also signed on this page. Sarah Lincoln. 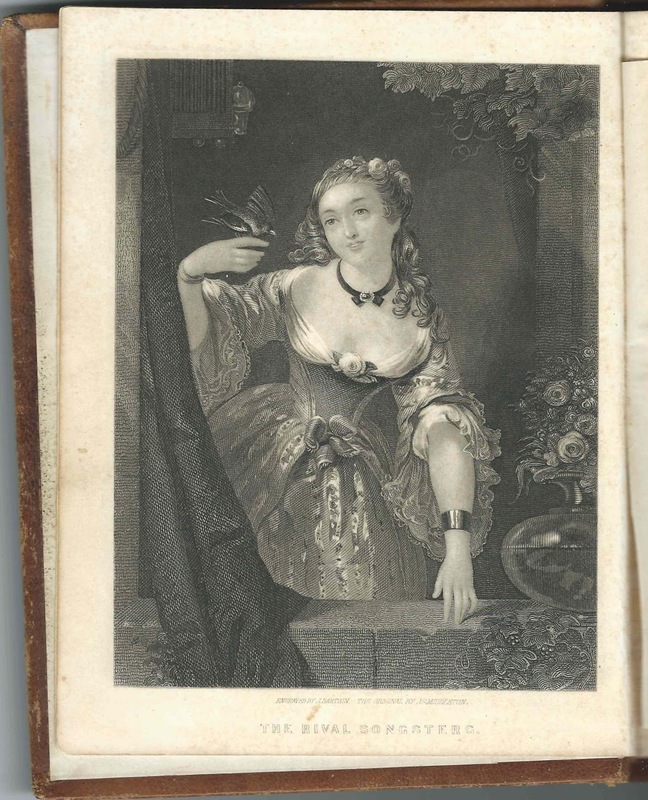 Interestingly, one of the engravings in the album, of a woman, is entitled, in blue ink, "Sarah Lincoln". It seems that Nancy Lenora may have noticed a resemblance between the two women.
? Ross, signed at Brandon, Vermont, on April 14, 1857. Name looks like Zulon E. Ross but could be Julia E. Ross. John Shipman of Springfield, Ohio; not sure of surname; middle initial could be A or S or B or ? Marcia A. Webb. She was Marcia Ann (Fales) Webb, a younger sister to Nancy Lenora (Farr) Burt's mother Martha (Fales) Farr. 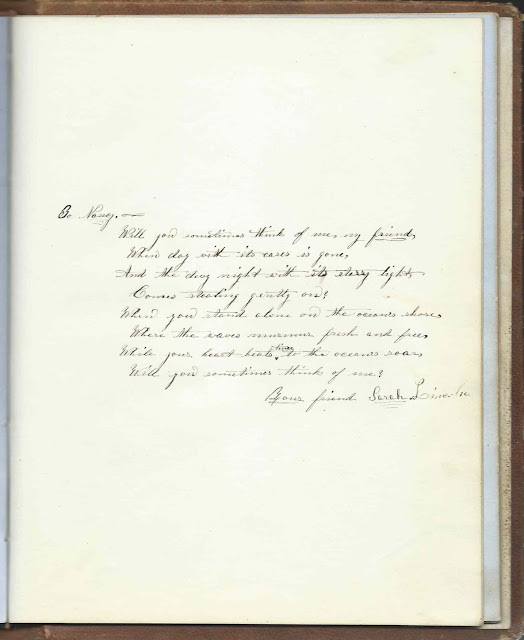 Marcia's husband Francis C. Webb, "Frank", signed the right facing page. Marcia and Frank later moved to Chippewa Falls, Wisconsin. F. C. Webb, signed at Brandon, Vermont on January 6, 1856. He was English immigrant Francis C. Webb whose wife Marcia Ann (Fales) Webb signed the left facing page. They later moved to Chippewa Falls, Wisconsin.